Former Haiti President Michel Joseph Martelly will make a historic visit to Claflin University on Thursday, Feb. 2, as part of the university’s Visionary Leader in Residence program. He will discuss issues in Haiti as well as opportunities for faculty, staff and student engagement. Martelly will be accompanied by former First Lady Sophia Martelly. Born on Feb. 12, 1961, in Port-au-Prince, Haiti, Martelly was elected the 56th president of the Republic of Haiti and served in that position from 2011-2016. He won with more than 67 percent of the electoral vote. While in office, Martelly’s focus was transforming the education sector, focusing on employment, the rule of law, the environment and energy. Martelly will give a lecture at 11 a.m. to a group of sophomore students in the William V. Middleton Fine Arts Center. He will also participate in two separate roundtable discussions at the Arthur Rose Museum. The first will begin at 2 p.m. with faculty and staff, and at 3:15 p.m., Martelly will hold a roundtable discussion with students. The Columbia World Affairs Council and Congressman James Clyburn will co-host a reception for the Martellys at 5:30 p.m. at the Columbia Marriott Hotel. 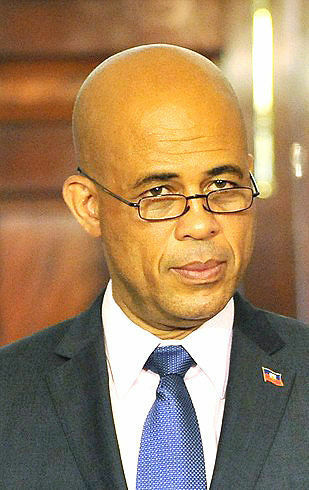 During his term in office, Martelly faced the aftermath of the devastating earthquake that struck the country on Jan. 12, 2010, and his presidency focused on relocating more than 1.4 million people who were living in tents into permanent housing and rebuilding the capital of Port-au-Prince as well as government institutions. On March 26, 2012, Martelly was awarded the Golden Great Cross of Merit Duarte Sanchez y Mella from Leonel Fernandez, president of the Dominican Republic. In July of 2012, the International Academic Unit of the University of Panama School of Law and Political Science bestowed upon him the Great Cross of the Order of Gil Colunje, one of the highest distinctions given to a foreigner, in recognition of his commitment to the development and restoration of his country. Since ending his mandate in February 2016, Martelly has been focused on giving speeches about his commitment to education and the rebuilding of Haiti as well as focusing on the family foundation, “Fondation Rose et Blanc” (Pink and White Foundation), which he and Sophia started 21 years ago to provide assistance to those most in need throughout Haiti. For more information, contact the Office of the Provost at 803-535-5404.